Our NSC 1000-S Soy Medi-Foam, high-resilience entry-level coil pressure redistribution therapeutic surface outperforms any other spring mattress in the industry. Breaking the rules of economics by providing a high quality, cost effective entry-level mattress meeting any budget. 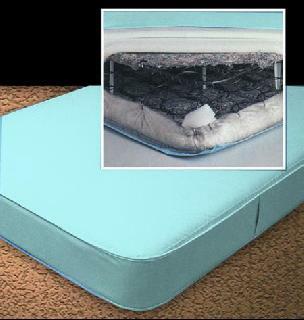 The cover consists of Medtex, an anti-rip fabric with anti-slip technology when the bed is articulating, providing Patient/Resident comfort and Nursing Staff assistance. With an anti-bacterial cover threaded with expandable polyester, the NSC1000-S assists infection control by resulting in no leakage or contamination. We Use Only Soy Medi-Foam…Why? This neutralizes the off gassing smell that irritates Patients/Residents, as well as reducing heat retention which is the largest complaint from 100% petrochemical based products. NSC Medical does not cut corners when it comes to fire prevention by using fire barriers as a cost effective method. We only use Fire Rated Foams providing guaranteed results with no compromise in Patient/Resident, Nursing Staff and Facility safety. Cover: The NSC1000-S cover consists of a 3-way stretch for easy removal and a zipper overlay for infection control. It contains an expandable polyester thread fibre that imbeds itself to material making this fabric completely fluid proof. Therapeutic Surface: NSC Medical is conscientious of our carbon footprint, therefore providing Soy Foam, Soy Visco and Soy Gel Hybrid Foams as an alternative to 100% petrochemical based products. By adding a full layer of Soy Visco or Soy Hybrid Gel as a top layer for all pressure redistribution therapeutic surface, we reduce the incidence of pressure ulcers, assist with healing skin breakdown and reduce Patient/Resident turning times for Nursing Staff. Most industry surfaces only offer pressure redistribution sections to reduce costs and meet minimum requirements.